Find out more about Rachele, The Bridal Tailoress, on her website and blog or by following her on Facebook and Pinterest! Jackie and Asif's wedding also had some lovely bridal fashion details. Jackie's bridal gown was handmade by Mignonette Bridal (Chicago, IL). She wore her hair in a low, loose side bun accented with a white feather hairpiece. A stunning necklace and fur stole rounded out the look of Jackie's handmade bridal fashion. So chic! "The dress was repurposed from a floor sample that I purchased at a great price. Kpoené, my seamstress, wanted to give it a "bursting forth with joy" feel, and I was involved in all steps of the process, including meeting her at a local fabric supplier's store and selecting the fabric and beadwork. I wanted something different, so I chose an ethereal pale gray organza. The fabric was so beautiful in it's natural state, we decided to par down the dress design to something more simple to really let the free flow of the organza shine. Kpoené, Anne, and the other ladies at Mignonette we're too good to be true, and really felt more like girlfriends (in fact, a visit to them is overdue!)." A favorite Northern Michigan treasure is finding the rare Petoskey stone on the sandy beaches. For Ashley and Loren's wedding in Northport, Ashley wanted the stone to add a memorable touch to her and her bridesmaids flowers by having personal Petoskey stone bouquet brooches made. Each brooch was tied onto the satin ribbon of the stems of their gorgeous, bustling bouquets of white peonies and garden roses. While not obvious to all, it was a subtle and sweet memory for the Ashley and the important women in her life to have with them throughout the day. For Ashley and her six bridesmaids, each lady had a treasured memento of the special day, and Northern Michigan, to take with them home after the celebration was over. Katherine was impeccably dressed for her wedding, wearing a Christos gown and Jimmy Choo heels, and the men were just as stylish. Fun and colorful patterned bow ties complemented the charming Harbor Point Casino wedding and reception. Each groomsman and the fathers wore a different colorful pattern, and even some of the gentlemen guests embraced the style and sported their own unique bow ties. Please click here for the full gallery and read Monday's Real Wedding feature on Sam & Dono here. Be sure to check back on monday for another fabulous Northern Michigan Real Wedding! The Bride wore her grandmother's vintage wedding gown, which was purchased in 1956. 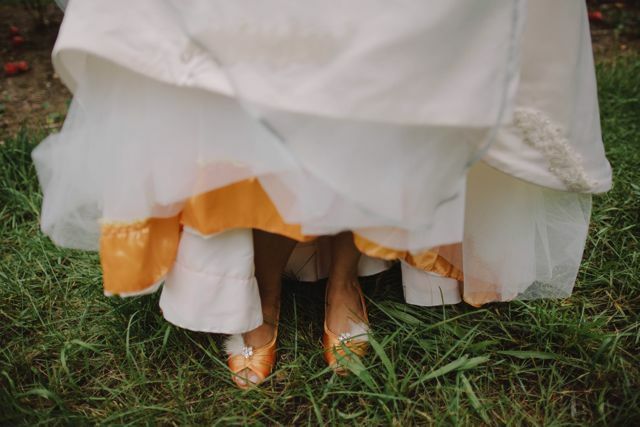 Her grandmother and her grandmother's sister wore the dress for their own weddings, and they will both be at the wedding. Amanda had the dress modernized with a tailor in New York, removing the original satin sleeves and bringing in the dress. We hear it all the time, "what about the guys?" Diego treated his groomsmen right and made sure that during the wedding day they had more to flash than just their devlishly good looks! The Groomsmen gifts were Cufflinks from each of their alma maters, Cigars and a smoking lounge fit for Mr. Havana himself, Diego and his groomsmen were not left out of the wedding activities and look quite comfortable and content enjoying the night their way. From quirky to classy, the assortment of men’s attire at Captain's Quarters of Historic Downtown Traverse City never ceases to create amazement. Captain’s Quarters has formed admiration and respect from its visitors during its 45+ years of service to our community. Each staff member is talented and knowledgeable in their own way, providing a constant flow of different experiences that creates the perfectly accommodating atmosphere. As a groom you can expect a great selection of both tuxes and suits, in loads of styles and options, for either rental or purchase. They have some of the most competitive rates available for wedding parties on their rental packages. They also carry a fine selection of cufflinks, bowties, money clips and more to outfit your wedding party or provide a memorable gift. Visiting Captain’s Quarters wouldn’t necessarily enlighten you to everything it has to offer. There is a social club created by the CQ aptly named the Haberdashers - a group of nearly 140 members who meet quarterly, dress to impress and appreciate the quality and panache of fine dressing. These men live and breathe what they offer in their store! Head down to Captain’s Quarters for refreshing conversation, exceptional staff and choices upon choices of attire for your upcoming wedding.